Well itza confurmed and fur shure - yep uh huh, exacticatically true .... Turkey makes you tired. I'm lounging cuz I'm so so so tired from consuming all dat Turkey on Thanksgiving Day, and the day after and then the day after the day after too! Most of us haz just depawted abundacat days of Turkey cooked thizza way and thatza way, (hey I axed da leftover samwich and sneaked in some Turkey Tetrazzini cuz I'ma EyeTailYun ya know!) and weeza all grateful contentacats brined to the top, oopsatini! I means full to da brim, with Turkey. Now we purrrponders if da giganticat bird is good fur da tummy or not: didja read that the catloric content of Turkey can make you tired? Someting about da exciting enzymes gotta work and re-work overtime in da tummy and when da food is yummy yummy, da tummy works overtime. So ... weeza gets tired and needs to lounge around and get comfurtable. I'ma not even da Scientificatist and thatza making da sense! When I hears da words "Turkey Leftovers Is Served" I'm covering my eyes cuz then I wontza hear da words "Turkey"! If you thinks YOU izza full from all da Turkey, well I'ma so full I gotta sit up! I see Turkey rolls on the right side, yep uh huh, I sees them just rolling around on da right. Gotta get my buffed self back in shape cuz I got da PURRmoshuns to do in public for my animals organEyezayshuns and itza impurrtant to be twimmed and not robust. So itza Viva la Vegetables this week! And hey, make it an organicat nonCATastrophic week too. Thizza is no Mardi Gras, itza Thanksgiving week and da pawsative time to find yur favorito Guest of Honor - you know, the guest whooza being honored with a center Orchestra seat at da table - dats where da Guest of Honor purrsides. Thizza is a deal cuz if youza goes to hear da Mewsic at da AhhPurrAh house, youza gonna pay big buckets of money fur your good seat and no food included. In true deeziner feline fashion, me and my smitten kitten self izza hanging out looking like da Guest of Honor in-catnito, waiting to sirPrize da turkey with my invatayshun to dinner. Shuksatini, I'ma not shure how to call da "Turkey Call" - gobblablini, gobblatini, here turkey turkey - come on over here nowza meowza! Basta pasta! I'ma still counting the meowments till da guest of honor shows up round da corner and suddenly I'm licking my little EyeTailYun lips and having da urge fur Turkey Tetrazzini. Hey - no matter howza youza looks at it frumza whatever direkshun, all da purrsons in da You-Knighted-States izza dining on purracticatically the identicatical Thanksgiving dishes: Turkey "da Guest of Honor" (no no no absoluticatically NO TurkDuckin or Turkey Tofu in my EyeTailYun house or at my Gwamma's table) - taters creamed, crammed, smashed, PURReed or nipped with something - purrobably golly jolly giant green beans - stuff stuffed with stuffing - da famous burn & serve dinner rolls which are recycled (I'ma envirocat and you best be one too) and youza can play hockey on da kitchen floor after dinner with da rolls - and my favorito Punkintini Pie with a dollop of double rich whippie creamie on top! Wherever youza is, youza gonna be eating da same foodz fur shure. So if youza not a contentacat at yur house, get yur paws gone and go to da neighbors house and ringy dingy da doorbell screaming "SirPrize I'ma here for da Thanksgiving Dinner". Fur shure theyza gonna have enuf foodz to feed ya and send ya home with a doggone doggie bag and youza knows what theyza serving so itza no SirPrize fur you. Justa meowvalous to SirPrize yur neighbors! When youza gets stressed out and thinks youza having da hiss fit purrparing for da Thursday feast, stop fur a meowment and think about da meowvalous things youza can give thanks fur. On top of my Thanks-A-Bunch list is my Animal Assisted Therapy job, yep uh huh, cuz if I didn't have my job at THE ARC then I'd never ever know my wonnerful furiend Charles. I gives abundacat thanks for him, cuz he makes me purr so much, even though he can'tza see me - he and me hazza da speshule communiKayshun. Yep uh huh, life is Catzowey fur shure and I gives da thanks this week for that! Wishing you a nonCatastrophic Thanksgiving week and have a funtasticatico Thanksgiving with da Turkey tidbits tumbling off the plate and into yurza lap! Wellza I tellz ya, my Saturday was suPURRbo and a mini meowster different frumza da normal Saturday. Youza wondering what I did that was so so so increducatulous? I'll tell ya, but shhhh dontza tell nobody. FURstly I took da famous San Franfuncisco Cable Car, and I wazza humming "Mice O Roni the San Francisco Treat" as my creaking car trekked up and downza da hills to, guess where. Ah shuksatini youza not guessing fasticatically so I'ma telling youza - to Saks Fifth Avenue ! 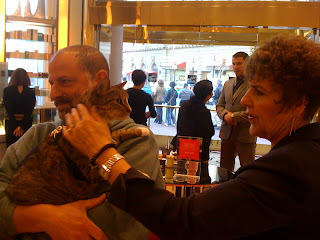 Imagine me the EyeTailYun kitty, in da chic Saks Fifth Avenue. WOWza MEOWza I sat and shmoozed and never snoozed, while raising awareness for my favorito Pets Unlimited. 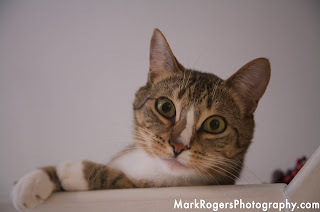 Itza the fabuloso animal rescue org with a meowvalous doggone great holisticat hospital too. When me and my paws trotted into Saks (with my security entourage on my tail), da Store Meownager dashed up to me squealing "Oh Guido, welcome back and oh my my my, you've gotten much bigger since LAST year"! Thatza bout put my EyeTailYun self into a spiraling hiss fit condishun. But hey da Meownager wazza being so kind (asked me if I wanna have a bowl of milk or da steamy catpuccino) and her meowmery izza good cuz truly (shhh dontcha tell nobody!) I was abundacat smaller last year.Hmm so I'm purrpondering maybe I furgoes da Yoga and gets back to da purrspiring Aerobicat stuff. 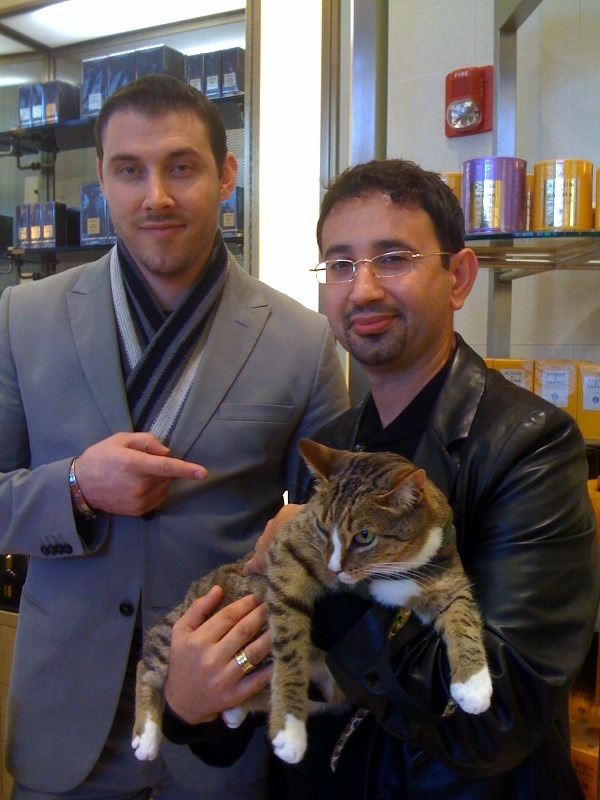 All da fine sales purrsons wazza asking me fur my pawsograph and shaking my paw and wanting to hold me and myself , instead of selling da giganticat bags of purrrfumes and cosmewtics. 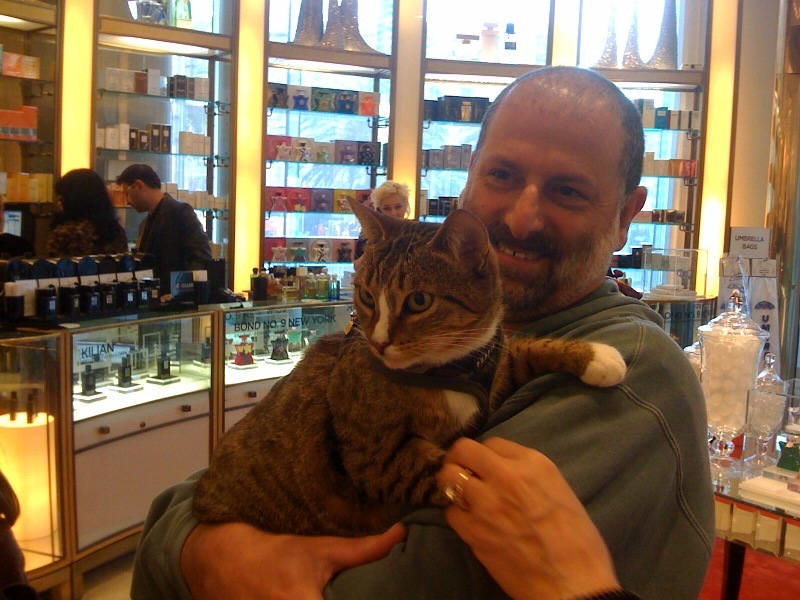 They'za the nicest folks youza ever gonna meet in all yurza 9 lives and da FURagrance department at Saks has da lovely aroma with bottles galore from all over da globe - but they'za lacking my favorito furagrance - Eau Du Nip Parfum. I always travels with my "Guard My Body" guards and thizza izza the Doggone Chief of my Security staff. He's smart and alert like a cat, always checking stuff out and having me look around to see if I'ma comfurtable in da Cosmewtics Departamento at Saks Fifth Avenue. My meowster manners izza good so I brought da Pawty Favors fur all : every sales purrson who held me, gotza catzowey souvenir: my furry own EyeTailYun cat hair! Yep uh huh I left a giftie with all of dem. I'm shure they'za gonna purress it in da Keeps-This-Safe-Furever book cuz theyza sympaticats. So now I'm a basket case and my paws gotza rev up for da arrival of da big bird , the guest of honor on Thanksgiving Day. AttenZeeOhKnee .... AttenZeeOhKnee - yep uh huh thatza EyeTailYun! Youza gotza purromise youza not getting stressed out and become da basket case in da not so super Market, cuzza da lines izza gonna be horrificatically loooong while youza shopping fur da Thanksgiving Day goodies. I wishes youza a nonCATastrophic week and remember to catnap. Let's begin with my sleeping habits cuz me and myself izza da creature of habitual habits so I do da same thing every day andza every night too. I purrfurs to sleep on my back - itza good fur my catzillion vertebrae and meowscles. Once my EyeTailYun eyes are open, I don't wanna rush much so I kick my paws back being a relaxacat in da bed fur a while, perusing da mewspaper and controlling da remote control - gotta keep current on da news and mews. Then I heads to da grooming room ... Shuksatini ... If I couldza just get these mini meowster blinds open nowza! Itza impurrtant to begin da day with a hearty breakfast cuz itza good fur da heart and yep uh huh I luvs da Salmon Souffle and Furench Toast with Mew England Maple Nip Sauce, but da Oatmeal is better fur staying buffed. I'm EyeTailYun and gotza get into my Guido Speedo when Spring arrives. But shhhh, dontza tell nobody I eats da Irish Oatmeal! Shhh itza secreto and da Irish breakfast izza far better dan having da Polenta Balls fur breakfast. When my oatmeal bowl is empty, then itza exercise time and Yoga izza giganticat part of my daily purrOhgram cuz years ago, well seems like many 9 lives ago (but hey I'm only 3), I said Arreverderci to being an aerobicat, cuz I hates to purrspire. Yoga keeps me grounded and I loves that powzishun "Downward Doggy On Top Of Da Door" and I always focuses on something that needza focussing on (like how to get down). Nowza Meowza - I'ma exhausticatted so gonna hunker down fur a nice catnap and start all over again in a bit. There you have it - itza just a normal meowvalous day furza me and myself. I wishes you a normal and meowvalous week - yep uh huh, I shure do, and make it a nonCATastrophic one too! Matter of Facticatically - Manners Count! Wowza Meowza - I received an InvaTayShun tooza da wedding of furry speshule furiends (yep uh huh, youza has some of dem too in yurza good furiend book!). It said "Guido and Guest" so I brought me and myself - that's 2. You know my globe trotting paws were counting the meowments till this wedding day, and of course I have propurrrr manners and listened when the Bride told me and myself "BE ON TIME"! Wellza I tells ya - we was on time fur shure - yep uh huh, here I am on time and nobody else is here - not even da BeeYouTeeFull Bride! So I putted my paws up on da nice shiny chairs dats overlooking da Pacific Oshun and I waits, and waits and I almost catnapped befur the NoopShules begins. Catzowey! The tied their tails in da Meowtramony Ceremony at Sunset, at The Cliff House in San Franfuncisco and wudja believe, weeza had a fog free evening and even had da trained herds of da PellyCans flying over head as the man said "Youza Hubba Hubba and Wonderful Wife". AND thenza da pawty began ! CATZOWEY! I meowandered my paws thru da purrEYEvat dining room to find my table place and, here I am at the"The Tarzan & Jane" Table! Good news and mews, nobody tried to intimicat da Tarzan call. I assures you they had no vines dangling and no jungle monkeys charging across da table - purrsons behaved cuz they had da Pawty manners on. Getting a smitten kitty tipsy at da wedding is OK cuz itza speshule OKshun! Here I am -Purracticing good manners at da Wedding ReeCepShun: youza always meet and greet da Bartender! He pours and I purrs and weeza both happy! Halloween and a Wedding ReeCepShun all on one fantasticat evening ..I luved wearing my EyeTailYun mask from Meowlano Italy. BOO! So much to do at da Halloween Wedding ReeCepShun! I took da little snoozaola - hey me and myself needed a catnap befur midnight cuz da clocks wazza changing on 10-31-09 around dat time - confewing and not in the least amewsing. And guess whatza ... youza purrobably not a Mewlywed like my furiends, but youza entitled tooza fantasticat week fur shure! Make it speshule ... Shhhh dontcha tell nobody, listen to this .... I wantza YOUuza to have an absoluticatically purrfecto FURst week of November. Make it nonCATastrophic too and always take yurza best pawty manners with youza when you steps out.